Successfully Added Handheld Photo LED516AS Light - 516 LED Bulbs, Dual Color Temperature 5600K + 3200K, Built-in 5200mAh Battery, Dimmable to your Shopping Cart. This handheld LED light is an ideal solution for studio photography as well as an easily portable tool for photo shoots in different locations. Powerful, energy-efficient and sporting a large 5200mAh battery, it's a great addition to any professional photographer’s gear. A great tool for professionals and amateur photographers, this handheld LED516AS photo light brings the brightness of 516 LED bulbs to your photo shoot. Enjoy the flexibility of having just the right light in your photos, no matter what conditions you are working in. The LED light offers dual color temperature: 5600K or 3200K and is dimmable so you get great control. 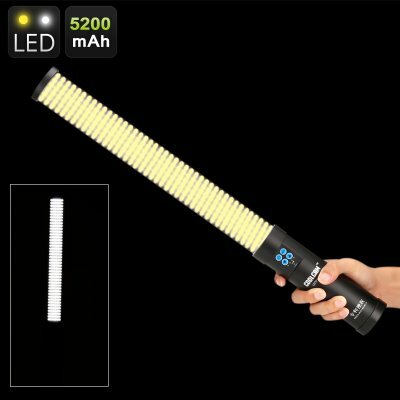 The LED light features ergonomic design and is easy to operate with one hand. You can also easily attach it to a stand, bracket or tripod with no additional accessories needed. It’s light-weight, portable and comes with a convenient carrying bag — great for when your photo shoots are in different places and you need to frequently switch locations. The photo light comes with a powerful 5200mAh battery and runs on both AC and DC power. Designed to be energy-efficient, it won’t consume too much power while giving you all the brightness you need with its 780 lux per meter lighting. The Handheld LED516AS LED Photo Light comes with a 12 months warranty, brought to you by the leader in electronic devices as well as wholesale photo LED lights..